Do you face any difficulty while hiking or hunting in a trail? Ok, after reading this you’ll find an ultimate tool which will help you a lot overcoming this issue. 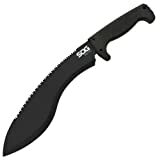 Here, we’ll be discussing a popular machete type named SOG SOGfari kukri, which is vastly used for clearing brush, blazing trails, chopping wood, harvesting crops, making shelters, preparing meals, hunting, and survival purposes. The SOGfari kukris are an impressive addition to the SOG family. SOG is mostly popular for military personnel and is making knives for US military and police forces for years. It’s imported from China. 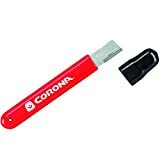 They are used in different situations where knives or other edged tools don’t work. This is a great handy tool that can be your perfect choice during home & outdoor works. In this SOG kukri review, we’ll discuss in a way so that it’s easier for you to make a decision before purchasing a new kukri. What Makes The SOG Kukri a Great Buy? The whole discussion will be divided into various sections describing its parts. Then, there will be some FAQ’s about the SOGfari kukri that people are very interested in, and finally the ending thoughts on it. Let’s go for the main discussion. The first part is the blade. SOGfari kukri blade consists of two edges, the main cutting edge, and back saw edge. The blade is black and made of 3Cr13 high carbon steel which ensures its durability and performance. It has a hard cased black finish. The cutting blade has a curved-straight-edge. The overall length of the kukri is 18-inch with a full tang. Overall weight is 15.0 ounces. Its model number is MC11-N. It is 12-inch long and about 0.8-inch thick. On the opposite side, there is a unique jagged-toothed saw blade like a hand saw. It consists of double ground teeth that cut the brushes and bushes with optimum ease. The blade has a slight bend near the middle. The cutting blade can be nicely used for chopping. The saw blade is used for slicing through branches or small logs. The saw blade’s cutting song will give you an adventurous mood. You can certainly use this kukri in different purposes mentioned before. While using the machete you’ve to check its sharpness. If needed, sharpening both edges can be done very comfortably. As the blades are made of high carbon steel, you can use this kukri for a long period of time without sharpening. The edges can hold the sharpness for a lengthy period of time. Next, is the handle of the SOG kukri. The handle is 6-inch long. As SOGfari is a full tang machete, the handle and the blade behave like a single part. As a result, the handle is durable, exerting the user’s leverage along the full length of the blade and tang. There is a hole in the handle to mount lanyard. By using a suitable cord in lanyard hole you can have secured gripping. This is made of flexible Kraton rubber which makes an outstanding grip in both dry and wet conditions. SOGfari kukri’s handle is one of my favorite handle which I will refer to any friend of mine. Kraton rubber gives non-slippage handle. Another useful addition is a spiked tang on the back of the rubber handle for pounding and scraping. After the handle, comes the sheath. 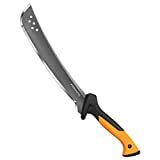 Machete sheath is not the main part of a machete but it keeps the machete safe, rust free and gives easy carrying facility. So, we recommend machete user to use it for your own safety. The sheath of SOGfari is made of nylon which is medium class sheath material but it’s a nice-looking sheath. This is not the top class, but with that low price, it’s just okay for me. The zipper and belt loop attachment system ensures your extra safety. It can be clipped to a belt, backpack, or other gear for easy carrying. You can always make your own sheath if needed. 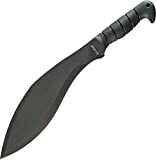 So, the medium quality machete sheath should not be an issue for you as the price is really low. SOGfari is a multi-purpose machete. It cuts well within short times. 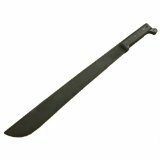 If you use this for clearing brushes, blazing trails, chopping wood, hunting, survival conditions this machete will help you a lot. The handle is comfortable enough. Also, there is no tendency of breaking, weakening or loosening of the handle as the machete is used over time because of its full tang. After using the machete, always keep it within a sheath. Is the machete saw very handy? Answer: Yes, the saw is really awesome. 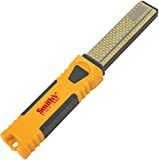 Could I use this for self-defense? Answer: Yes, It’s blade is good for self-defense. You will not be disappointed by using it. Does it come sharp out of the box? Answer: Yes, it does come sharp. Honestly, this kukri type machete is a very handy one with a moderate price, but it delivers well on quality. Besides, you can use it for military purposes also. If you’re looking for a top-class machete, we’ll recommend you to choose this. It consists of a great performing blade, deep cut saw edge, good handle, and medium quality sheath. This is a real tool for survival, exploration, and adventure without any doubt. Danny is an avid hunter and outdoorsman who just love the wilderness. He learned the surviving techniques from his predecessors and became the skilled man of today. He is a family guy who loves his family dearly. From an early age, he became very fascinated with different survival tools among which machete was one of them. This website is for sharing his knowledge and skills for those who feel a close bond with nature just like him.